The Dyna Glo Charcoal Grill, DGN576DNC-D Premium is for serious grillers who are looking for something a little special. 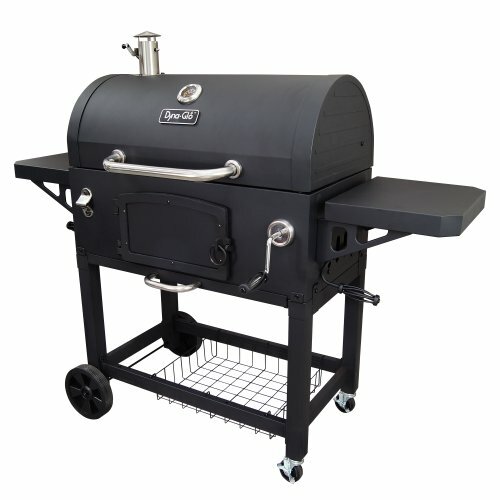 It’s one of the larger models and is in a higher price bracket than smaller, regular home charcoal grills. If you’re holding a large outdoor party or function where you’re serving grilled food, you’ll probably need something this size. It’s a heavy duty, well designed grill and is made to last. If you’re investing in something like this, you’ll want to be sure it will stand the test of time. In this Dyna Glo grill review we’ll look at the strengths and weaknesses of it and see if it really is worth the investment. Dyna Glo grills are built to a high standard and there are a range of them to choose from, although this one isn’t their most expensive, it is one of their premium models. The company is a leader in product development and take pride in their customer service too. In order to get perfectly grilled food there needs to be some control over the amount of heat given off. 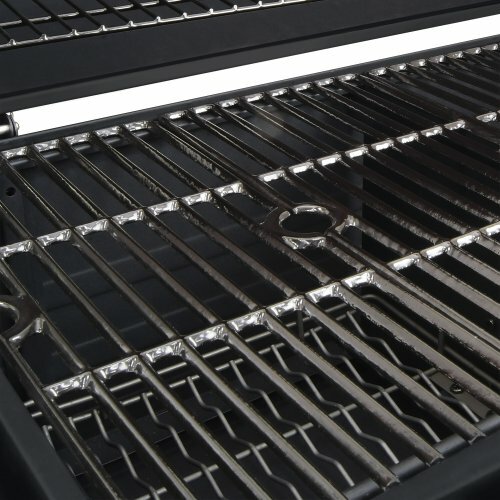 Whilst this Dyna Glo grill isn’t perfect in that area, the charcoal basket adjustment system in the form of a crank handle, lets you raise and lower the charcoal to help control the temperature. 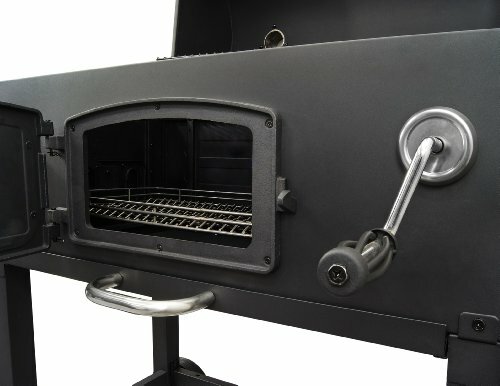 The access door to the charcoal is made from cast iron and it helps to keep the heat inside as you cook. This will help to keep the temperature constant. Open the door to add more charcoal or just stoke it up. The cooking grates are made so they will slide from side to side, making it easier to get to the charcoal. There’s more temperature control with the stainless steel smoke stack and adjustable flu. The side dampers will help to control the airflow which will help to control the temperature and the efficiency of the burning. Adjusting the flu in the smoke stack not only helps with temperature control but with the flavor of the food too. If you like a smoky taste to your food, you can adjust it to your liking. We know how important it is to have meat thoroughly cooked and at the right temperature. 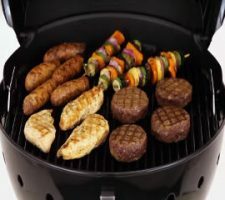 There shouldn’t be any problem with this grill but to make sure, it has a built-in thermometer with an easy to read gauge. The outside rim is stainless steel which gives it a very attractive look. It’s important to have a good cooking surface to get good results so the grate is also made from cast iron and is porcelain enamelled for this reason. The enamel coating is high gloss making the grate easy to clean which would otherwise be quite a difficult task after cooking. Being made from cast iron, it means the heat transfer will be maximised. There are three sizes of the Dyna Glo charcoal grill in this range, standard, large and extra-large. The premium version we’re looking at is the extra-large and has an impressive 816 square inches cooking area. It’s one of the largest in this price range and said to be able to grill up to 30 hamburgers at once! To save on mess there’s a slide out pan at the bottom of the unit. It collects the waste ash and grease so it can be easily thrown away. This keeps the waste in one place, so cleaning up once finished isn’t difficult. As you might expect, the grill is fairly heavy so it’s fitted with two 8″ wheels made from heavy duty resin. Being made from this material makes them durable and long lasting. The other two legs are fitted with 3″ casters which are lockable. This means the unit is easily moved around, despite its weight and will be stable without moving when the caster locks are on. There’s plenty of storage for when you’re grilling with two side shelves and a basket underneath the unit. These are good for utensils, the plates for serving or even the food to be cooked. If it’s a hot day, its hot cooking so there’s a stainless steel bottle opener fixed to the side, just right to open a cold beer to cool you down as it gets hotter! Why would you consider buying this particular grill? It’s not the cheapest you’ll find, but is it one of the best? We think it is if you want something that’s very well built and is designed to last a long time. You can tell its good quality by the materials used such as cast iron, stainless steel and porcelain enamel. It’s the largest of the three in the range and boy is it large! 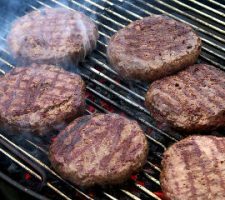 That’s one of the reasons it carries the “premium” tag, with a cooking area that can handle up to 30 hamburgers at once, how can you go wrong? It’s perfect for large parties and even better if you hold them regularly. There’s plenty of temperature control with the adjustable flu and the cast iron access door but at least one customer has described it as burning very hot. Perhaps a little experimenting might overcome it. You obviously want plenty of heat but you don’t want too much or your food might not cook thoroughly all the way through, or it may even burn. It’s been mentioned the lid doesn’t completely seal when it’s closed. That shouldn’t really be a problem as creating a seal shouldn’t be necessary to keep the heat in. As with most grills, this one does need to be put together. Assembly isn’t very difficult really, the manual gives very detailed instructions and it’s reckoned you should be able to do the job in around 50 minutes. You might think otherwise when you look at the instructions, but at least they’re comprehensive! If you fancy stepping up a notch with something similar, but with extra features, take a look at the Dual Zone Premium DGN576SNC-D.
You’ll need somewhere to be able to store it as it is very large, but it’s meant to be. When you’re using it though, you’ll realise why you chose it over others as the Dyna Glo Charcoal Grill, DGN576DNC-D Premium is pure quality for serious grillers. Depending on where you store your Dyna Glo charcoal grill, you might want to consider buying a cover for it. If so, it’s worth getting one that’s made to fit it, namely the Dyna Glo DG576CC premium grill cover. 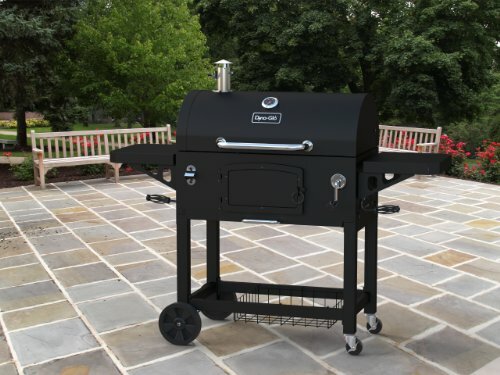 It’s the largest size they make, measuring 24.8” x 61.7” x 48” and is made for grills that have a smoke stack on the left hand side. There’s also a custom sleeve to fit over the smoke stack. The material is a water resistant heavy duty PVC with a 600 Denier polyester lining and double stitched seams. There are strong nylon handles to make it easier to use and Velcro adjustable straps to make sure it fits snugly. It has mesh side vents to make sure air can flow around it. This is important, otherwise moisture could build up, causing corrosion to set in. 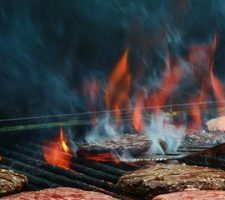 If you’re buying a good quality charcoal grill, you might as well look after it properly with the best protection you can give it. This grill cover is high quality and fits very well, but please remember that it’s water resistant rather than completely waterproof. 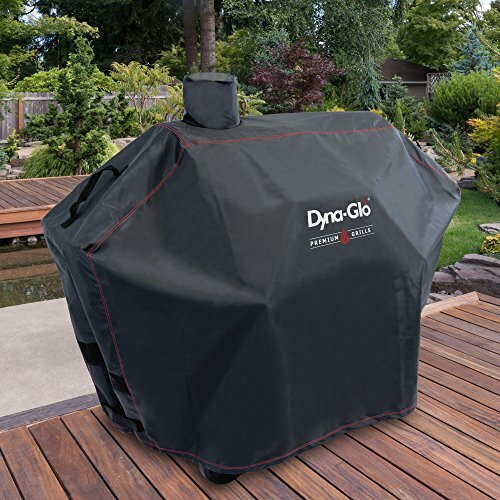 If you want to protect your Dyna Glo Charcoal Grill DGN576DNC-D from the elements, this is the Dyna Glo grill cover to do it.